I'm back from a 2 week vacation (it was very relaxing). I mentioned that my sisters and I were swapping fabric...this is the stack that I came home with! nettie...did you get that check off the fridge? thanks for being my supplier. Ok...I'm jealous! Great fabric. I'm sure you will do spectacular things!!! HI there - I came over from your etsy shop. 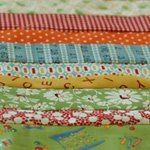 I just love all your scrappy quilts - I have sooo many scraps too! Your quilt kits are so cute and I love how you show a finished picture of each one - they are so beautiful!